close up Taipei Plas Taiwan Machine Builders Aim for Higher-End Applications Major taiwanese injection and blow molding and extrusion machinery OEMs plan to broad- en the appeal of their brands by providing higher-end technology solutions at prices competitive with Euro- pean or Japanese machines. That message emerged from a visit to Taiwan previewing some of the exhibits for the 12th Taipei Inter- national Plastics & Rubber Industry Show (Taipei Plas), coming Sept. 21-25 to Taipei, the Taiwanese capital (taipeiplas.com.tw). 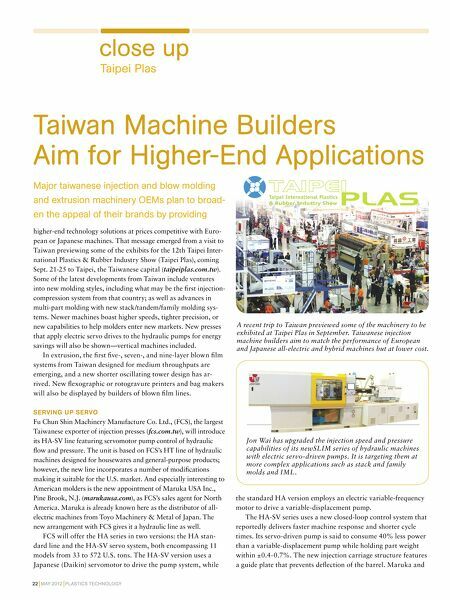 Some of the latest developments from Taiwan include ventures into new molding styles, including what may be the first injection- compression system from that country; as well as advances in multi-part molding with new stack/tandem/family molding sys- tems. 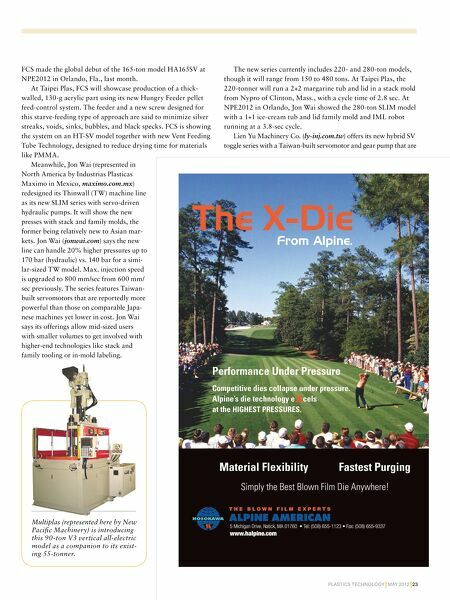 Newer machines boast higher speeds, tighter precision, or new capabilities to help molders enter new markets. New presses that apply electric servo drives to the hydraulic pumps for energy savings will also be shown—vertical machines included. In extrusion, the first five-, seven-, and nine-layer blown film systems from Taiwan designed for medium throughputs are emerging, and a new shorter oscillating tower design has ar- rived. New flexographic or rotogravure printers and bag makers will also be displayed by builders of blown film lines. SERVING UP SERVO Fu Chun Shin Machinery Manufacture Co. Ltd., (FCS), the largest Taiwanese exporter of injection presses (fcs.com.tw), will introduce its HA-SV line featuring servomotor pump control of hydraulic flow and pressure. The unit is based on FCS's HT line of hydraulic machines designed for housewares and general-purpose products; however, the new line incorporates a number of modifications making it suitable for the U.S. market. And especially interesting to American molders is the new appointment of Maruka USA Inc., Pine Brook, N.J. (marukausa.com), as FCS's sales agent for North America. Maruka is already known here as the distributor of all- electric machines from Toyo Machinery & Metal of Japan. The new arrangement with FCS gives it a hydraulic line as well. FCS will offer the HA series in two versions: the HA stan- dard line and the HA-SV servo system, both encompassing 11 models from 33 to 572 U.S. tons. The HA-SV version uses a Japanese (Daikin) servomotor to drive the pump system, while 22 MAY 2012 PLASTICS TECHNOLOGY Jon Wai has upgraded the injection speed and pressure capabilities of its newSLIM series of hydraulic machines with electric servo-driven pumps. It is targeting them at more complex applications such as stack and family molds and IML. the standard HA version employs an electric variable-frequency motor to drive a variable-displacement pump. The HA-SV series uses a new closed-loop control system that reportedly delivers faster machine response and shorter cycle times. Its servo-driven pump is said to consume 40% less power than a variable-displacement pump while holding part weight within ±0.4-0.7%. The new injection carriage structure features a guide plate that prevents deflection of the barrel. Maruka and A recent trip to Taiwan previewed some of the machinery to be exhibited at Taipei Plas in September. Taiwanese injection machine builders aim to match the performance of European and Japanese all-electric and hybrid machines but at lower cost.